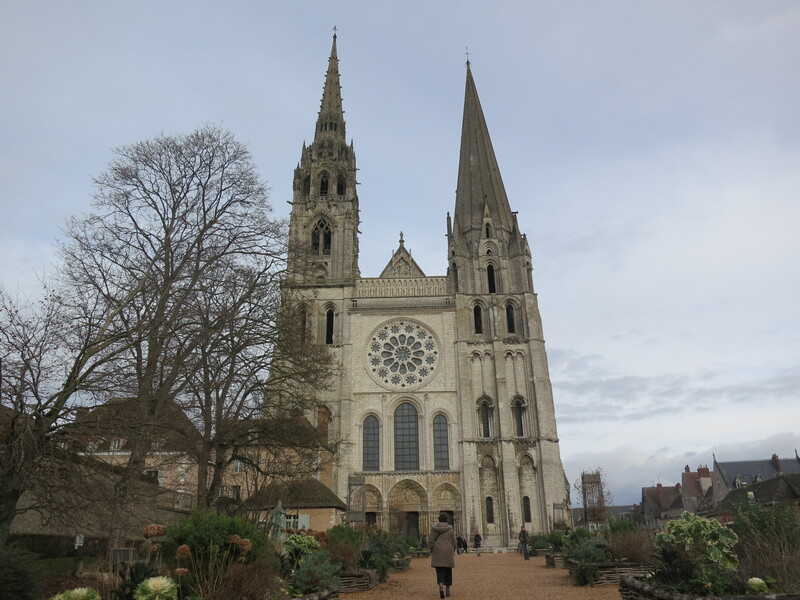 There is one benefit to travelling solo and that is to be spontaneous and so early on New Year’s Eve I decided to go to Chartres. Checking the web I saw that trains left regularly from the Gare Montparnasse which I had discovered while exploring the surrounding neighborhood so armed with shoulder bag, coat and scarf off I went. Again, buying a ticket was a breeze, there was a British flag above a booth in the ticket office so I headed for that and with a minimum of fuss I was on my way. Had time to buy a baguette with ham, cheese and tomato, hung around the indicator boards waiting for the platform to be announced and joined the surge of passengers when it was it was divulged. I grabbed a seat upstairs for a better view, seats comfortable with a retractable table, foot rest, clean windows and a very tiresome Brit’ trying to impress a much younger Asian woman. Shades of Phnom Penh for those of you with long memories. Off we went, gathering speed through the suburbs which, I have to say, were a bit grim. Reminded me of those tower blocks in Moscow featured in so many movies. Out into the flat countryside, green, low single story farmhouses, water towers dotted about, rain streaming across the train windows. Stopped at unknown towns, Epernon, I wonder what people do there, Maintenon, I thought that meant “soon” when translated, who knows. Woods, not really forests, but fairly large woods, with mistletoe growing on the trees in great clumps. Ah, talking of mistletoe it is one of the main reasons I wanted to go to Chartres. Been reading these books see. All about ancient times, pre Roman, Roman and post Roman. It seems, say the books, that back down the centuries the Druids major site in Northern Europe, apart from Anglesey, was centered among the forests around Chartres and the vast amount of mistletoe that grew there. When the Druids were wiped out the locals built the cathedral on the site of the mistletoe groves. Good story anyway. 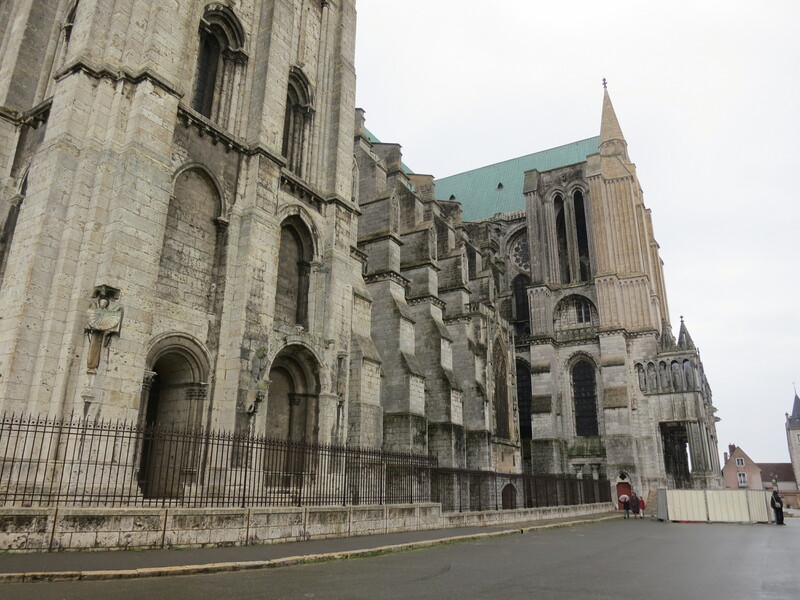 I arrived in the town of Chartres and stepping outside the train station it was clear what route to take. The cathedral completely dominates the town, rising up with its two spires, one from 1160 and the other from the early 16th Century. I was warned in the guide books that the town would be extremely crowded, it was, by me. There were two or three other tourists who got off my train, that was it. I ambled up mainly deserted alleyways, found the town square, found, incongruously, an Indian restaurant. There was a small market in the main square but hardly anyone about, it was cold and raining, and it was New Year’s Eve, which might explain the lack of people. 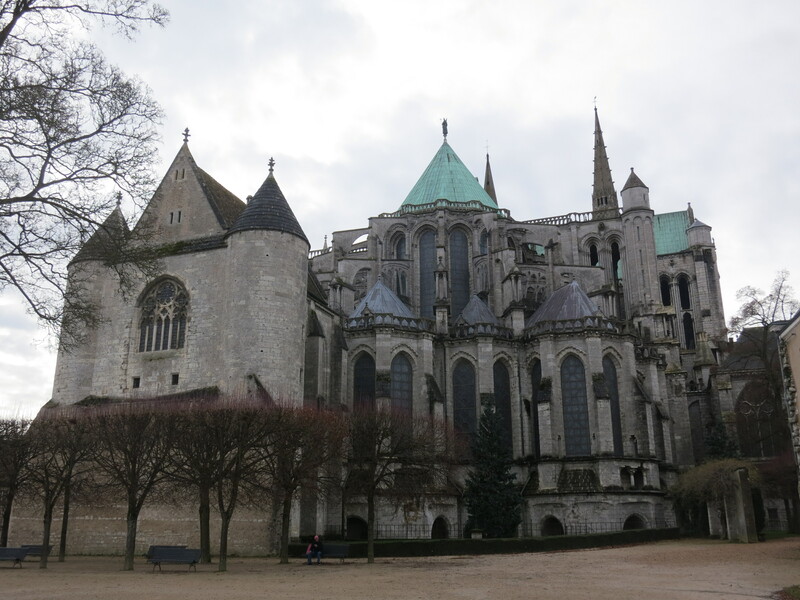 The cathedral was everything I had expected, huge and looming over the small houses round about, some of which appeared to have been there since the Middle Ages. There is no point in trying to describe the truly unique blue stained glass windows which were created in the Twelfth Century and then the secret of their creation was lost, even to this day. There is a project underway to clean the dirt and candle grease of the Centuries off the interior and so far the results are stunning. There seems to be a certain amount of controversy about this cleaning or restoration. 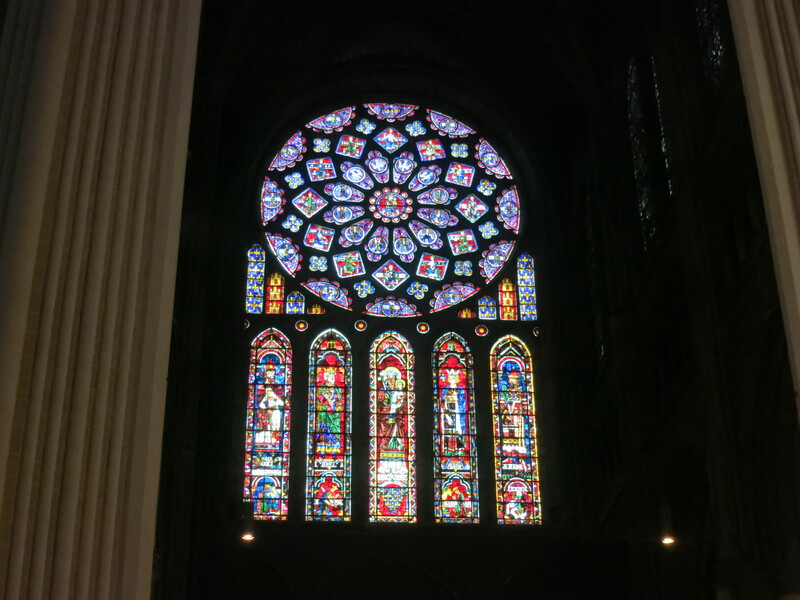 Some feel the resulting blinding whiteness of the stone somehow detracts attention away from the stained glass. I liked the result, no matter that we cannot imagine, or know, how it looked upon completion in the Mid Twelfth which is the point of all the work. Maybe the following photos will help you make up your own mind. The choir, cleaned, unlike the rest of the interior. 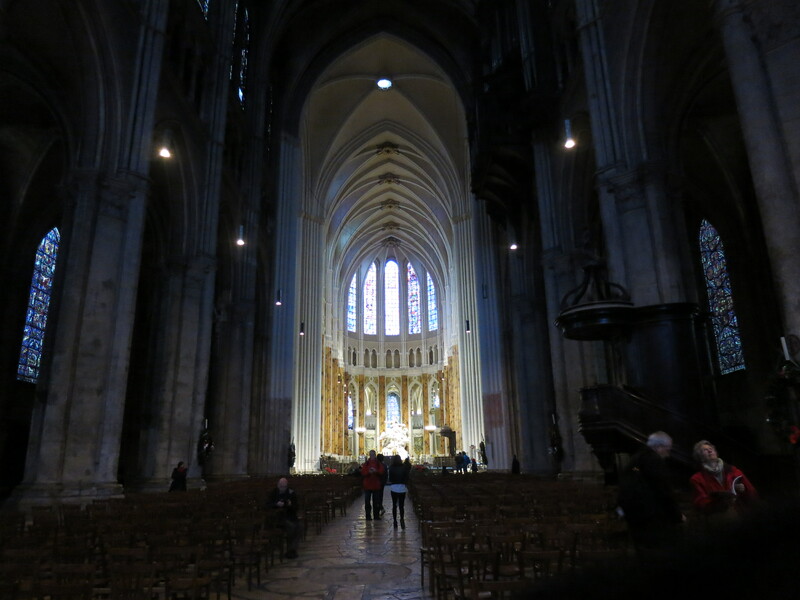 Loved the photos of Chartres, particularly the gorgeous rose window. Glad to see they didn’t have “the washing” out like they did in Winchester!! What a memorable way to spend New Year’s Eve, and then to share with all of us. Wonderful! Thank you Anna. An unusual New Year’s Eve for me.